Running tracks are oval in shape. They are made this way on purpose. If you are running a short race, such as a 100m sprint, it is convenient and sensible to run this in a straight line. You could also run a 200m or 400m race in a straight line, but the required track would be a very long. It would be inconvenient. It would be a poor spectator sport. It would be awkward in logistics moving from one end to the other end when not racing. It would not be the best use of space and would make a poor arena. By making a running track oval in shape it allows things to be placed in the middle (other sporting fields, or venues for other track and field events). An oval shape is also a fine shape to build a spectator arena around. Below is a typical oval track arrangement. 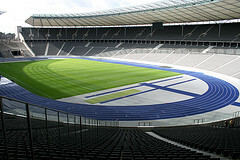 Usually, at the bottom, is a 100m straight track used for short races (sprints and hurdles). Longer races start on the oval part of the track and run part of the race on a curve. In addition to the 100m straight sprint section at the bottom, there is a 17m deceleration region and a shorter setup section before the start line. There is also a finish line.  The finish line is designed to be common for all races, and these constraints (and the desire to place other things in the center) dictate the shape of the track. An official oval* running track has two straights of length 84.39m and two semi-circular ends with an inside radius of 36.50m (more of this later). An oval track is designed to be 400m around (using the inside lane). *Another, sometimes used format, for tracks is to make them slightly wider (to facilitate wider activities in the middle of the track). These tracks are made by combing end curves as a hybrid of two radii. So that runners don’t interfere with each other (or trip, or hinder, or stumble), shorter races are run in lanes, with each runner getting their own dedicated space. When the race is a straight line, the start and finish lines can be at the same orthogonal distance apart. However, an issue arises when part of the track is curved. If we did not compensate for the curve, runners on the inside track would have a distinct advantage because, with a smaller radius of curvature, the tangential distance around the track is shorter. Running tracks can have a variable number of lanes (typically from four to nine) and, in accordance with IAFF requirements (International Association of Athletics Federations), each lane is 1.22m wide. If the race were run in a straight line, it would not matter where in the lane the runner ran. However, since the track is curved, it is in the interests of the runner to take a more inside trajectory. The IAFF appreciates this, and in calculating their track dimensions, takes this into account. Whilst the inside track radius is 36.50m, the projected curve radius for the runner is not taken to be 36.50m + (1.22m÷2), which would be the radius if the runner ran in the middle of his/her lane. Instead the runner is assumed to be running 0.30cm (approximately one foot) away from the inside edge. This gives a running radius of 36.80m for the inside track. You can see now how the math works out. A 400m oval has two straights at 84.39m and two curved sections of 36.80m × π in length. This is the distance for the inside track. As more tracks are added, these are wrapped around the inner track, like layers of an onion. Each track is of width 1.22m and it is assumed, as with the inside track, the runner will take a line 0.30m from the inside edge. Below is a table of track dimensions for the different lanes. It would only be fair if every runner runs the same distance so, as the outer tracks run on a greater radius of curvature, the starting positions are not in a straight radial line but are staggered based on length of the curve. The table below shows starting positions for a 200m race. The inside track runner will run exactly half loop of the track. The further out the racer starts, the more ‘advanced’ the runner in that lane will start. The table below shows the angular starting position; measured from what would be the centre of the circles. (For a 400m, these starting angles are double and on the other curve of the track). LANE - This is the ordinal number of the lane with the first lane being on the inside. RADIUS - This is the radius of the curve 0.30m into that lane. DELTA - This the length a track of this radius track is longer that the inside track (and thus how much lead-in is needed to make it a fair race). ANGLE - This is the corresponding staggering angle. Starting at this offset ensures that a racer in that lane runs the same distance on a curve. All runners run the same distance. It’s up to the individual psychology of each runner to decide if they get perceived advantage of starting ‘ahead’ in the race by appearing to be in a position of lead at the start, or if (on the inner tracks), they are behind and it motivates them to catch up, pace, or overtake those ‘infront’ of them. According to official rules, formal races cannot be run on tracks with more than nine lanes. As the number of lanes increases, so does the radius of the curve. If the radius gets too large then outer lane would gain too much advantage as the curve is so gentle it behaves like a straight section of track; runners find it easier to run on a straight track instead of a curve. (A race greater than 100m that is run on a track with radius greater than 50m is not an official time and is ineligible for any record). I am not a runner, and have no personal experience of which lane is more preferential and athletes prefer or feel gives advantage. I have, anecdotally, heard the the very inside lanes are harder to run because the curve is very tight, and the far outside ones give you nobody to chase, so the middle lanes seem to be the sweet-spot. One for the four highest ranked athletes (or teams) to determine placings in lanes 4,5,6 and 7. Another for the fifth and six ranked athletes (or teams) to determine placings in lane 8 and 9. Another for the three lowest ranked athletes (or teams) to determine placings in lanes 1,2 and 3. This seems to imply that the three inside lanes are the worst, the two outside are the middle preference, and the four internal the best. Calculations for distances run (and thus starting positions), as we have seen above, are based on the assumption that a runner races on an arc 30cm away from the inner line. What are the consequences of running a different distance from the inside lane edge? If you run closer to the edge, your radius of is decreased, so you’ll be running a shorter distance than the track was calibrate for. The inverse happens if you run further out. How much difference does this make to the total difference you will run? Also, how much difference is there by lane? Below is a table showing the differences (in meters) for a 200m race depending on your displacement from the inside lane divider. Clearly for 30cm, there is no difference, and you can see the nearer you get to the inside, the shorter the distance. You can also see how this difference changes based on the lane you run in. (The closer your lane is to the inside, the higher the percentage change on the radius, and also the greater percentage of the circle you run). The difference between two ultimate extremes (running right on the inside edge of lane cf. running right on the outside edge of a lane) can be almost 4m over a 200m race (a 2% difference, caused by someone running in the inside line shortening their distance by 0.94m, and someone running on the outside line lengthening their distance by 2.89m). This is a very measurable difference, but a ridiculous extreme. More realistically, a skilled professional athlete might run about half-way between the 30cm calibrate line and the inside lane divider. A 15cm spacing leaves sufficient gap for an athlete to put their left foot in, moving their body centreline over to a +0.15m radius curve without them stepping over the line and being disqualified. A +0.15m radius (cf. +0.30m radius) curve equates to approximately 40cm shorter distance run (with a slightly larger advantage for those on more inside tracks). 40cm over 200m race is a 0.2% decrease in distance needed to be run. How significant is a 0.2% change? The current Word Record for a 200m spring is 19.19s, held by Usain Bolt. A 0.2% change represents about 4/100ths second over this distance. World records have changed hands over time differences shorter than this! TL;DR - Run as close to the inside line as you possibly can! If you liked this article, you might like to read this article about Usain Bolt, the fastest man in the World, and what time, theoretically, he might be able to run a 100m dash at if he were able to run at top speed for the whole race. Have you ever wondered whether the wind is an advantage/disadvantage if you are running a multi-lap race in a breezy stadium? Does running with the wind compensate for the times you run against the wind? Read the article there are back again to find out.